Home » Incometax » How to pay TDS on sale of property? TDS on sale of a property is applicable if a property value is more than 50 lacs. This rule is applicable to any immovable property and land other than agriculture land. This rule was introduced in 2013. As per the rule, the buyer of the property has to deduct 1% TDS when he pays to the seller. This TDS amount should be deposited to the government. It can be deposited either online or offline. In this post, I will explain step by step process of paying TDS on sale of property. In order to make payment for TDS on sale of property online or offline follow the steps given below. Visit – https://onlineservices.tin.egov-nsdl.com/etaxnew/tdsnontds.jsp and click on FORM 26QB. Select 0020 if you are paying tax on behalf of corporate or Select 0021 if you are paying tax as an individual. Fill up the form 26QB mentioning details like PAN Card number, Address, property details, the amount of tax etc. Once you form is filled you need to select the mode of payment. The system gives two different modes of payment. (1) e-payment through net banking – immediately – Select the option as per your convenience and press “Proceed” button. If you select e-payment through net banking method you will be redirected to net banking page where you can select your bank and make payment. Once the transaction is completed Challan 280 is displayed by bank. Print this chllan 280 and keep it safely. If you select this option FORM 26QB along with unique reference number will be generated for you. It is valid for 10 days. You need to visit nearest authorized bank along with a cheque. The bank will pay the money and give challan to you. How to issue Form 16B to the seller for the TDS deducted on property? Once you make the e-payment details will be reflected in your form 26AS after seven days. Now as a buyer you need to issue Form 16B to seller. Form 16B is proof that you have deducted TDS and deposited to the government. Visit https://www.tdscpc.gov.in/app/login.xhtml and login as a tax payer with user id and password. 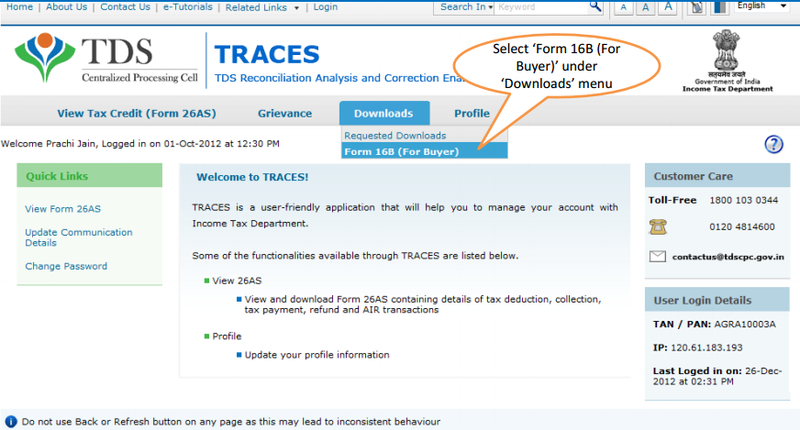 Go to Download menu and click on Form 16B for Buyer. One form will appear asking about Enter Assessment year, Acknowledgment number and PAN card number of the seller.Enter the relevant details and click on proceed button. Form16 B Request form will appear mentioning details to be printed on form 16B. Click on Submit request form. The success message will appear mentioning that “Your request for download of form 16B has been submitted. Again go to Download menu and click on Requested download button and you will be able to download Form 16B. 1% TDS has to be deducted by buyer and not by seller. TDS is also applicable when there are more than one buyer or seller. Tax is to be paid on entire amount. Example – If you purchased property worth 60 Lacs, TDS of Rs 60,000 is applicable. PAN card is mandatory to complete the transaction. If PAN card is not available with seller, 20% TDS needs to be deducted. This TDS amount needs to be deposited along with Form 26QB within seven days from end of the transaction month. The buyer has to issue form 16B to seller for TDS on property. The buyer has to keep Form 26QB.